Now that the party is in government, it’s singing a different tune on these clean-energy technologies. While Five Star entered government this year with pledges to shut down pollution-belching power plants and boost renewables, its latest green strategy caps incentives for projects like those in Montieri, known as geothermal energy. That would be a blow to both the region’s fragile economy and for Enel SpA, the nation’s biggest utility and owner of 34 plants in the area tapping heat from below ground. The situation prompted some 2,000 voters to come out in protest against the government on Dec. 1, illustrating the difficulty ministers have in balancing the desire for cleaner forms of electricity against the need to limit the cost of energy. Perched 800 meters high along a winding road between Rome and Florence, Montieri is an emblem of the government’s effort to wean Italy off energy imports, which account for 80 percent of its supply. The country is Europe’s second-largest importer of oil and depends on Russia for much of its natural gas. Those factors are colliding with ambitions to rein in greenhouse gas emissions and meet targets set out in the Paris Agreement on climate change. The site offers a rare source of steam that’s replicated in only five other places in the world, including California, Japan and Indonesia. For at least a dozen villages surrounding Montieri, capping incentives for geothermal wells would be both a financial and emotional blow. The Tuscan region gets about 30 percent of its power from geothermal sources, with zero emissions. And while only 2.3 percent of Enel’s power generation comes from the wells, they play a crucial role in guaranteeing stable electricity output to the grid. Unlike wind or solar farms, the power from geothermal wells flows without interruption. If the government moves ahead with limiting geothermal incentives, Enel could miss out on about 600 million euros ($681 million) of investments, according to a person close to the situation who asked not to be named because the estimates are confidential. The company declined to comment. For its part, the government insists it’s still working toward expanding renewables including geothermal energy, which will be the subject of a future decree setting out incentives. “We have always been clear, one incentive does not exclude the other, but technology is still evolving for this source,” said Gianni Girotto, the Five Star lawmaker who heads the Senate’s Industry and Trade Committee. Those comments appear to contrast with the party’s earlier enthusiasm for all forms of renewable energy. Two years before his party took office, Girotto in 2016 called for a 100 percent renewable Italy with an effort that “should start from municipalities” like Montieri. 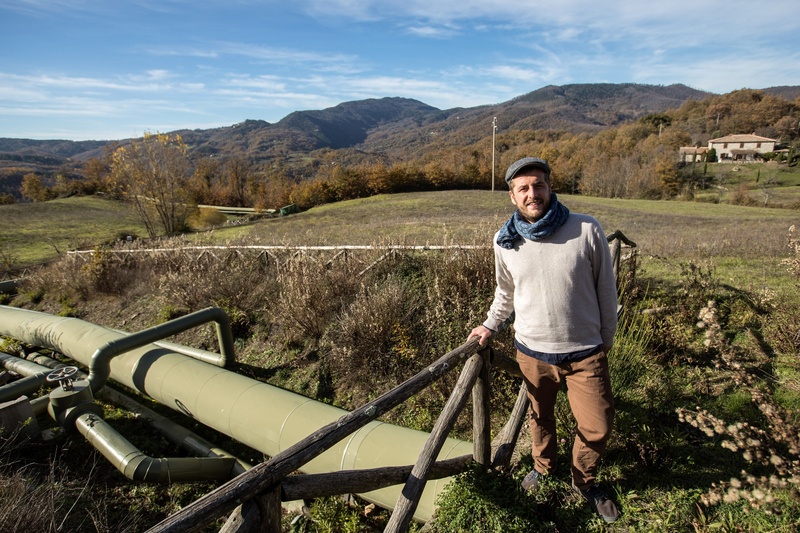 Residents of the town of Lardarello near Montieri see geothermal energy as part of a back-to-earth lifestyle and took to the streets on Dec. 1 to protest against the government’s vacillation. Whatever happens, the towns of Tuscany will be watching carefully. Schools, the hospital and police station in Montieri rely on electricity from Enel’s geothermal wells in the region, which tap a reservoir of underground heat 1,000 meters deep. Capping geothermal incentives would also threaten tourism to the area that people visit both for its wine and baths fed by thermal hot springs. A museum showcasing the history of geothermal nearby drew 60,000 people last year and helped Tuscany maintain a clean image in its production of cheese, olive oil, beer and wine. Over the decades, the highly visible geothermal cooling towers have become part the landscape. They were used as an art installation earlier this year, with images of constellations projected onto them. Events like this have left residents with a a fondness for geothermal energy, resulting in a protest against Enel’s decision to close one of the plants.